I just got back from a business trip to Colombia. You will be pleased to know that because of the constant attention of four bodyguards, a bullet-proof car, and an approximate net worth of $50, I was not kidnapped. I was, however, fed, gargantuan proportions of food, approximately six times a day, with an average of four desserts per sitting (I do not exaggerate). To the right you can see a photo of what was an appetizer…that came before the appetizer that came before the main courses followed by the four desserts. By the end of the trip, I was simply too fat to be kidnapped — no kidnapper could possibly afford to keep me alive given my new nutritional requirements. One of my most enjoyable experiences included shopping for handbags at a mall while accompanied by bodyguards. I believe the appropriate word for that is “weird”. While we were there we had lots of delicious local fruits and vegetables, which were purportedly pesticide-free. They also appeared not to be genetic mutants, which was a nice change. When I got back a few friends and I got together, and the Oprah-watchers among us brought up a recipe for a pesticide cleanser. See here for the recipe. Apparently this is for people who don’t want to be slowly killed by pesticides, yet are also unwilling to pay for organic fruit (I sometimes fall into this camp). I was concerned that the vinegar would make the fruit taste disgusting, but a friend of mine tested it and said it was just fine…the only downer was that she had to plan 10 minutes ahead before serving fruit. So, spray away! I plan to make the concoction sometime in the near future (you can get the grapefruit seed extract from health food stores and the usual suspects). If you make it, let me know how it goes! Then again, do you really want to live into your hundreds? Posted on April 30, 2008 by Sandi. 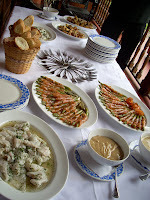 This entry was posted in Food, Popular, Travel and tagged Colombia. Bookmark the permalink.